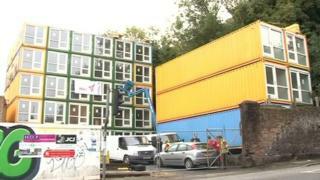 Homeless people who moved into a collection of converted shipping containers in Brighton have deemed the project an overwhelming success. An independent report into the satisfaction of residents staying at the Richardson's Yard site found 94% of people felt the accommodation was an improvement on where they lived before. But some tenants did have complaints about rent levels and heating costs. The site, run by the Brighton Housing Trust (BHT), opened six months ago. The charity was given planning permission to keep 36 units at the former scrap metal yard for five years. The survey, carried out by Juliet Amoruso, a social geographer at the University of Sussex, found people were most pleased about having their own kitchen, front door and toilet. One resident named Richard praised the site for providing a quiet, secure home for people to settle and "get on with their lives". Ms Amoruso said she found residents were "impressed by the shipping containers and, apart from minor maintenance worries, they seem satisfied with their homes". However, there were some areas which residents suggested could be improved as 56% of people surveyed disliked the cost of heating, while 50% were worried about rent levels. BHT Chief Executive Andy Winter claimed the survey showed the containers had been "a fabulous success" which had brought a derelict area "back to life". He said the trust had attempted to address the heating issues over winter by providing free electricity during the coldest months and cutting bills as much as possible. "Our rents are within the cheapest 30% of rents for a one bed flat in the city and within the maximum range for housing benefit payments", he added. Eight recommendations were made in the report, such as creating guides to help residents when they first move into the containers. The BHT said it had accepted them all and "we know what we have to do to sort out the teething problems we have had". Once the five year planning permission period has ended, the trust will move the containers to another site within Brighton or elsewhere.